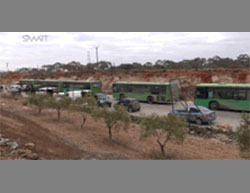 The first caravan reaches Al-Fu’ah and Kafraya (SMART News Agency, December 18, 2016). 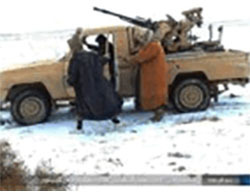 ISIS operatives near an off-road vehicle with an anti-aircraft gun on the outskirts of the T-4 military airfield. A suicide bomber codenamed Abdallah the Tunisian, who carried out a suicide attack in the Al-Tamim neighborhood, killing eight Iraqi Army soldiers. Sniper fire from one of the houses in the Al-Tamim neighborhood. Encouraging vehicular attacks in a series of articles: “Just Terror Tactics” (Rumiyah, November 11, 2016). 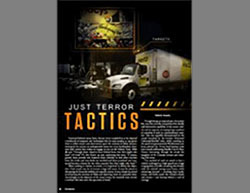 Example in the article of a suitable truck for a deadly vehicular attack. 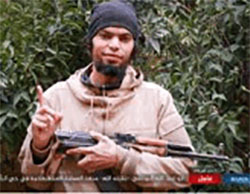 Suicide bomber codenamed Abu Hashem al-Radfani. Two mass-casualty terrorist attacks, in Jordan and Germany, were the most prominent this week. In Germany, twelve people were killed in a vehicular attack at a Christmas market in downtown Berlin. In Jordan, ten people (civilians and security personnel) were killed. ISIS claimed responsibility for the attacks. 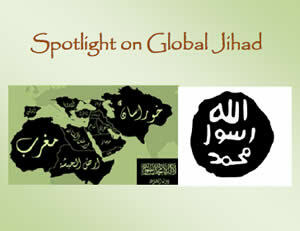 Recently, ISIS seems to be highly motivated to carry out terrorist attacks around the world to detract attention from its increasing difficulties in Iraq and Syria. The forthcoming Christmas and New Year’s Eve may be preferred dates to carry out attacks. This week, civilians and rebel organization operatives were evacuated from east Aleppo. In total, about 25,000 people have been evacuated, and it is intended to reach 50,000. Due to the difficulties in implementing the agreement, the UN Security Council resolved to send observers to supervise the evacuation and the provision of humanitarian aid to the inhabitants. This week, civilians and rebel organization operatives were evacuated from east Aleppo. The evacuated people were transferred to the rural area west of Aleppo and to the Idlib region, which is under rebel control. The rebel organizations still control a small area in southwest Aleppo, yet it seems that they are no longer an effective fighting force. It is intended to evacuate about 50,000 people from east Aleppo (The Guardian, December 15, 2016; SMART News Agency, December 18, 2016). The evacuation operation is still underway. 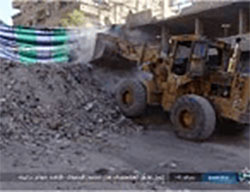 The evacuation operation is faced with difficulties and disruptions on the part of the rebel organizations, as well as Iran, Hezbollah and the Shiite militias handled by Iran. The difficulties stem from linking the evacuation from Aleppo with the evacuation of civilians from other sites in Syria. The sites in question are Al-Fu’ah and Kafraya, two Shiite towns north and northwest of the city of Idlib, which are surrounded by the rebel organizations; and the city of Zabadani, northwest of Damascus, and the town of Madaya in its vicinity, which are surrounded by Hezbollah and the Syrian forces. In total, according to the Red Cross, about 25,000 people were evacuated this week from east Aleppo. Over 3,000 of them are rebel organization operatives, and the rest are civilians. About 500 people were evacuated from Al-Fu’ah and Kafraya (Syrian Observatory for Human Rights, December 20, 2016). Linking the evacuation from Aleppo with the evacuation from other sites complicates the process. This has been well demonstratedby the fact that buses arriving at the towns of Al-Fu’ah and Kafraya were set on fire by rebel operatives. The rebel organizations denounced the burning of the buses, describing it as an “individual action carried out by independent people in the area of Kafraya and Al-Fu’ah.” They said it had been agreed that 4,000 civilians would be evacuated from the towns of Al-Fu’ah and Kafraya in return for the evacuation of civilians from east Aleppo. 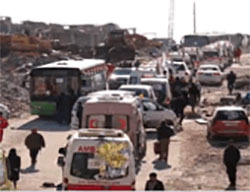 The delay of the caravans’ departure, according to the statement, is a “reckless action” which may jeopardize 50,000 people in east Aleppo (Al-Durar al-Shamiya, December 18, 2016). The UN and the United States accused Hezbollah of disrupting the evacuation agreement(December 17, 2016). 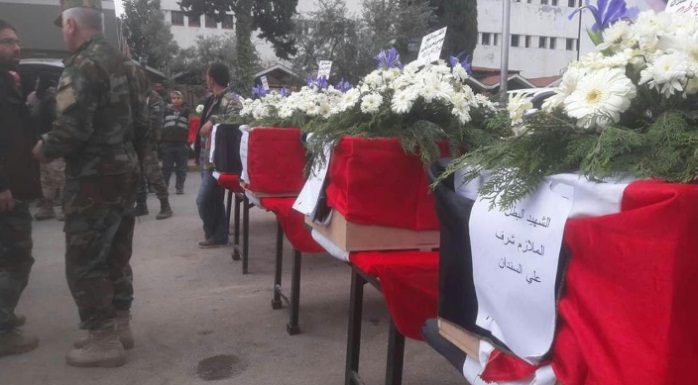 According to eyewitnesses, the Syrian forces and the militias handled by Iran had stopped a caravan of civilians who were being evacuated and killed 25 people. Following this event, the US demanded international supervision on the implementation of the Aleppo evacuation (Al-Jazeera, December 17, 2016). In view ofthe difficulties and the complexity of evacuating civilians and rebel organization operatives from Aleppo, and given the increasing international criticism, the UN Security Council convened on December 19, 2016, for a closed meeting that lasted for over three hours. During the discussion, the member states arrived at a resolution agreed upon by the UN, according to which observers on behalf of the UN and other relevant institutions would be appointed to directly supervise the evacuation of the east Aleppo neighborhoods. These observers will also ensure that the humanitarian aid, including medical aid, directly reaches the inhabitants (UN.org, December 19, 2016). Russia expressed its agreement to the wording, which represents a compromise between the draft resolutions presented by Russia and France. The Arab League ministers of foreign affairs announced that they accepted the UN Security Council resolution (Al-Arabiya, December 20, 2016). “Sources in the Syrian opposition” stated that following a series of meetings held after the fall of Aleppo, fourteen organizations announced their unification into a new umbrella framework called the “Syrian Islamic Authority.” The supreme commander of this framework will be the commander of Ahrar al-Sham (a large Islamic organization cooperating with the Fateh al-Sham Front); the military commander will be Abu Mohammad al-Julani, the commander of the Fateh al-Sham Front (the former Al-Nusra Front); the chairman of the Shura Council of this framework will be Tawfiq Shihab al-Din, the commander of the Nur al-Din al-Zanki movement (an Islamic faction headquartered in the city of Aleppo) (Al-Nashra, December 18, 2016). 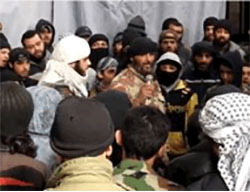 According to sources, the initiative to form the unity came from the Nur al-Din al-Zanki movement, and most of the organizations had comprised the operations room of the Aleppo Army (the rebel organizations’ headquarters in Aleppo). 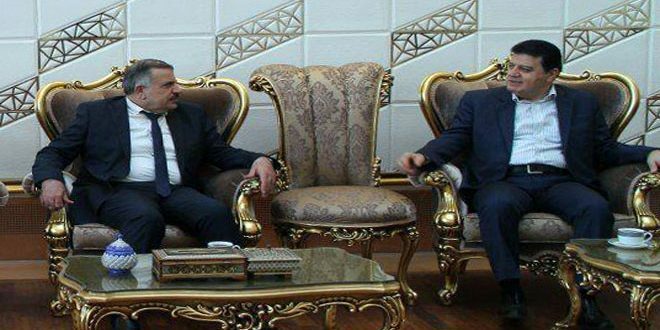 The unity talks are still underway (Al-Durar al-Shamiya, December 18, 2016). Based on a military source, the Syrian News Agency reported that seventy ISIS operatives had been killed in a Syrian Air Force airstrike west of Palmyra (SANA, December 15, 2016). According to another news item, at least 52 ISIS operatives were killed, and five ISIS car bombs as well as off-road vehicles with machine guns were destroyed in a ground attack carried out by the Syrian Army in the Palmyra area. The attack was carried out at a path used by ISIS to deliver reinforcements to its operatives in the area (SANA, December 16, 2016). On the other hand, ISIS reported that its operatives continued to attack the Syrian Army in the area of the T-4 military airfield, and that they managed to destroy several tanks and other weapons. Al-Raqqah: The Syrian Democratic Forces (SDF) took over five villages and several farms north of Al-Raqqah. ISIS announced that 18 SDF members were killed in an attack carried out against their bases about 30 km north of Al-Raqqah (Haqq, December 17, 2016). Al-Bab: The Turkish Army announced that Turkish Air Force fighter planes attacked 64 targets in Al-Bab and its environs. Turkish planes scattered leaflets calling on the city residents to escape to safe zones until the city is cleansed from ISIS forces. The Turkish foreign minister said that after the takeover of Al-Bab, the Turkish forces would advance toward Manbij. This statement indicates a Turkish effort to create an area of influence west of the Euphrates River, in territories previously held by ISIS. 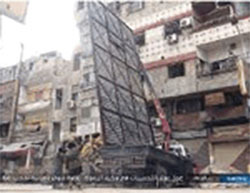 In the Al-Yarmouk refugee camp south of Damascus, ISIS operatives erected barricades for fear of attacks and sniper fire (justpaste.it, December 15, 2016). 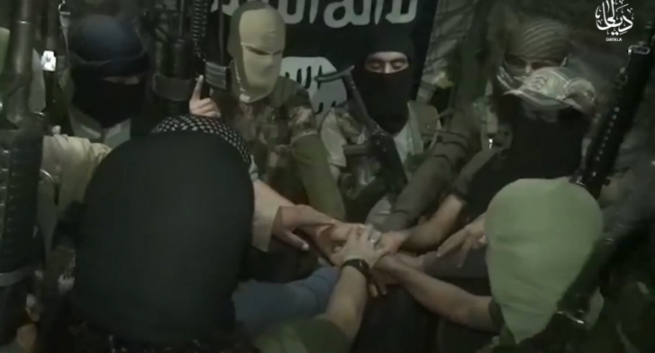 ISIS released a video in which a group of people in the neighborhood of Al-Hajr al-Aswad, in the vicinity of the Al-Yarmouk refugee camp, pledges allegiance to ISIS leader Al-Baghdadi. The pledge of allegiance is read by Abu Hisham al-Khabouri, the emir of the Damascus Province (YouTube, December 15, 2016). The Iraqi Army continues its slow advance in Mosul’s eastern neighborhoods, sustaining heavy losses. The army may have succeeded in creating a narrow path in the southeast of the city, to the bank of the Tigris River, which crosses the city (see map). In its fighting, ISIS uses various tactics: detonating car bombs by suicide bombers, sniper fire, firing mortar shells and shoulder missiles (Haqq; Aamaq, December 16 and 17, 2016). On December 13, 2016, two rockets were fired at Israel from the Sinai territory. The rockets fell in the area of the Nitzana crossing, on the border between Israel and Egypt. There were no casualties and no damage. 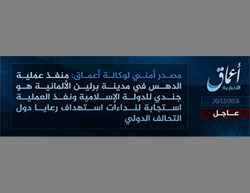 ISIS claimed responsibility for firing two Grad rockets at the Nitzana crossing and provided photos documenting the event. On December 19, 2016, at around 20:00, a speeding Scania truck drove onto the sidewalk, straight into a large crowd of shoppers at the Christmas market in downtown Berlin. Twelve people were killed, and 48 others were wounded. About an hour after the attack, a suspect was caught around two kilometers from the site of the terrorist attack. His interrogation revealed that he was a 23-year-old Pakistani asylum seeker. However, he was released shortly afterwards. There was another man in the truck who had been shot to death. 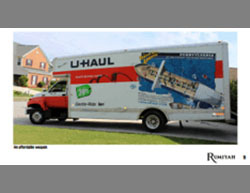 He was apparently the Polish driver of the truck, which had been commandeered by the terrorist. According to the interior minister of Brandenburg, the truck used to carry out the attack was stolen from a construction site in Poland. It is still unclear whether the terrorist stole the truck at the construction site in Poland or whether he commandeered it on the German-Polish border. ISIS claimed responsibility for the terrorist attack. According to Aamaq News Agency, the perpetrator of the vehicular attack in Berlin was a soldier of the Islamic State, who “responded to calls to attack citizens of the international coalition countries” (ISIS-affiliated Twitter page, December 20, 2016). 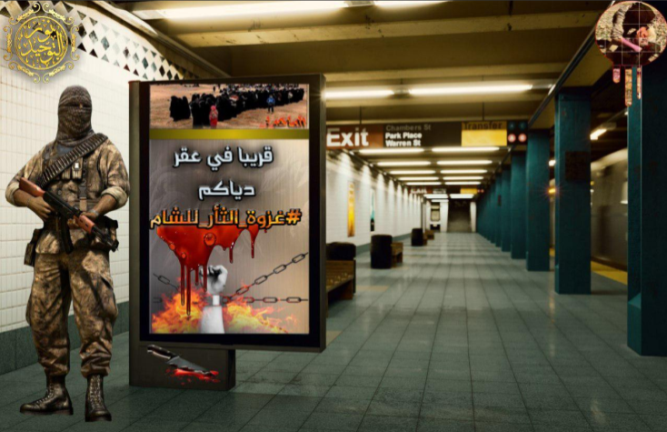 In recent months, ISIS has run a media campaign calling on its supporters abroad, especially in Western countries, to carry out attacks in their places of residence in order to assist the Islamic State. In this context, ISIS’s organ (Rumiyah, Issue 3) published detailed instructions for carrying out vehicular attacks such as the attack in Nice. On December 18, 2016, the Jordanian media reported that “terrorist operatives” had killed ten people and wounded 21 others in the city of Al-Karak, in the south of the country. The dead included four members of the general security service, three members of the gendarmerie, two civilians and a Canadian tourist. After an exchange of fire with the terrorist operatives, the Jordanian security forces killed four terrorists who had barricaded themselves in Al-Karak Castle. Large quantities of weapons were found in their possession, including explosive belts and Kalashnikov assault rifles (Al-Ghad, December 18-19, 2016; Al-Sharq Al-Awsat, December 20, 2016). The incident began when a general security service patrol answered a call to put out a fire in an apartment in the area of Qatraneh, in the Al-Karak Province. Upon arrival at the scene, they were shot at by armed men, and two members of the general security service were wounded. The gunmen fled the scene by car. Shortly afterwards, shots were fired at another patrol in the same province, with no casualties. According to later reports, shots were fired from Al-Karak Castle, hitting a number of security personnel and passersby. Jordanian security officials surrounded the castle and exchanged gunfire with the gunmen, numbering an estimated five or six (Al-Rai, December 18, 2016). On December 20, 2016, ISIS issued a statement claiming responsibility for the attack in Al-Karak.According to the statement, four soldiers of the Caliphate, equipped with automatic weapons and hand grenades, attacked crowds of Jordanian security personnel and citizens of a “crusader” coalition country in the Jordanian city of Al-Karak. The attack began with an exchange of fire with a (Jordanian) security patrol, in which its members were killed. Afterwards, a security center in Al-Karak was attacked. The attackers managed to kill the security personnel on the premises. 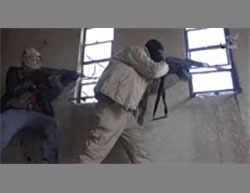 The attackers then barricaded themselves in Al-Karak Castle, where there were “citizens of the coalition countries.” Clashes ensued, lasting for several hours. The operatives were killed in the exchange of fire. Ten Jordanians and a Christian (this refers to the Canadian tourist) from the coalition countries were killed in the operation, and 35 others were wounded (Haqq, December 20, 2016). On December 17, 2016, ISIS’s Aden-Abyan Province claimed responsibility for a suicide bombing attack at the Special Security Forces base in northeastern Aden. A suicide bomber codenamed Abu Hashem al-Radfani blew himself up with an explosive vest in a crowd of security personnel. According to ISIS, about 70 people were killed in the attack and dozens more were wounded (Haqq, December 18, 2016). According to another version, 52 people were killed and 63 others were wounded (Yemen Press, December 19, 2016). According to a report from December 15, 2016, the Russian Federal Security Service (FSB) foiled showcase attacks by ISIS in Moscow. Four operatives from Tajikistan and Moldova, handled by ISIS in Turkey, planned to detonate powerful self-manufactured IEDs and carry out “high-profile attacks” (this apparently refers to attacks at train and bus stations and crowded places). In addition, automatic weapons, explosives and materials for self-manufacturing IEDs were seized (Russia al-Youm, December 15, 2016; Sputnik, December 16, 2016). That same day, the Russian Federal Security Service arrested two collaborators with ISIS’s branch in Russia. They were arrested in the city of Samara, on the banks of the Volga River. The two men, citizens of the Republic of East Asia, were aged 21 and 24. A search of their apartment revealed homemade explosives, a kilogram of TNT and instructions obtained from ISIS for making IEDs (TASS News Agency, December 15, 2016). According to the Turkish foreign minister, about 20,000 people left east Aleppo (CNN, December 19, 2016).